Whenever you see a file with an extension .wmv know that is a video compression format known as Windows Media Video (WMV). This video format has several video codecs that were developed by Microsoft. Originally, this file format was designed for purposes of online streaming with its main competitor being RealVideo. This video format is based on Advanced System Format, which contains the encoded content. With WMV you will be able to play it on different media players like Windows Media Player, VLC, Real Time player, MPlayer, K-Multimedia player and Media player classic. It is also important to note that an audio format that works with this video formats is Windows Media Audio (WMA). Away from the file format and now let us talk about the video codecs. To begin with, a codec is a way of encoding and decoding in a way to compress the digital data. This then ponders the question why we need WMV Video codec. If you are working with videos and you want to share them online, you have to compress them to a smaller size so that you can improve your efficiency such as the upload speed. When you use video codecs, you will be able to have lightweight files since they are shrunk to small sizes. Therefore, this then leads us to have the WMV video codec, which is ideal for Internet sharing. WMV codec is compatible with Windows operating system. Moreover, you will notice that Apple device does not support WMV formats. With that being said, it means you cannot play your WMV files on your Mac. However, there is a way out! What you need is WMV plug-in. This will enable you to play the WMV file on your Apple device. Now that you have known the definition of WMV codec and the need of WMV plug-ins, we can introduce you to 4 WMV plug-in or WMV codes that you can use. There are several codecs and plug-ins that you can use online but here just a few. Flip4Mac is a tested a proven plug-in that you can install on your Mac and play WMV files on QuickTime player or even your browser. Telestream pioneered it in the year 2004. At $9.99 only you will be able to play unlimited WMV and WMA files seamlessly. 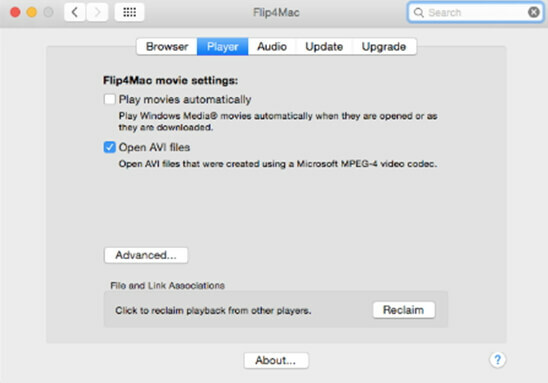 With Flip4Mac you will be able to play video codecs such as WMVA, WVC1, WMV1, WMV2, MP43 and others whereas the supported formats include ASF, AXF and AVI. Its playback is just perfect even when used on large screens. Moreover, Flip4Mac supports two browsers namely Safari and Firefox. Furthermore, it can be installed on Mac OS X 10.6.8 to 10.11.6. This is a codec developed by Microsoft that aims to bring you great WMV viewing. This codec enables you to open other file containers such as AVI. When you click on “Download” on the home site, you will be able to install it on your computer and play WMV. The legacy solution also will be able to utilize the coding through the video compression manager (VCM). Furthermore, this video codec only occupies 678KB of your disks space on either Windows Millennium, Windows XP, Windows 2000, NT 4.0, and Windows 98SE. 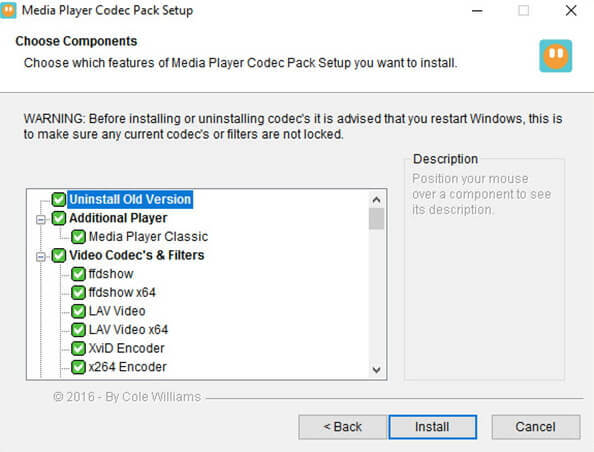 You can also install Media Player Codec pack on your windows and play the WMV codecs. When you visit its websites, you will be able to see the supported formats compression formats and supported resolution. For instance, it supports compressed formats like AVCHD, AVC, MP4, MPEG4, MPEG2, x265, h.265, HEVC, 10bit x264, x264, h.264, DivX, XviD. On the other hand, it supports file formats like WMV, FLAC, M4A, OGG and much more. Besides, it comes with a media player, codec settings GUI, Disc handler, Tray menu and codec settings UAC. 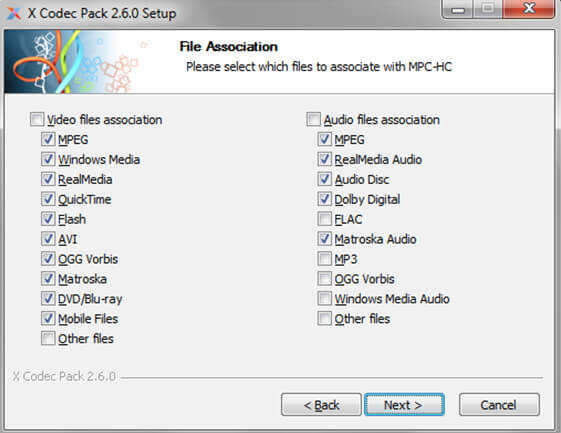 Remember, Media Player Codec pack is free, and it supports Windows XP, Vista, 7, 8 and 10. To end our list, you can check on this clean codec known as XCodec pack. This codec leverages on the way you can play those audio and video formats including WMV. Moreover, XCodec pack is well packaged with a smart media player. It is a safe codec that you can install on your Windows platform with its latest version supporting Windows 8. XCodec pack has no ads, and it is free to download. Furthermore, XCodec is multilingual, and it supports the following languages; English, German, Brazilian, Polish, Spanish and Portuguese. Its website has a good user experience without ads that boost its credibility. To conclude, you should not get worried about those files that fail to play on your Mac or Windows platform. On Mac OS just install the Flip4 Mac and play the WMV files. For Windows platform, you are spoilt for choice. You can install XCodec pack, Media Player pack or the Windows Media Video 9VCM. Try out any of these and enjoy watching your videos.